Anybody Going To The RV Show In Quartzsite Jan 2018? Been going to Q for years and have never seen dust like you talk about. We stay across from Post Office, dry camping, 8 bucks a night. Hope to see all of you that are going this year. WOW, I guess with the number of RVS in Quart. every year there sure are a lot of us insane people out there. we go every year. yes we are going. 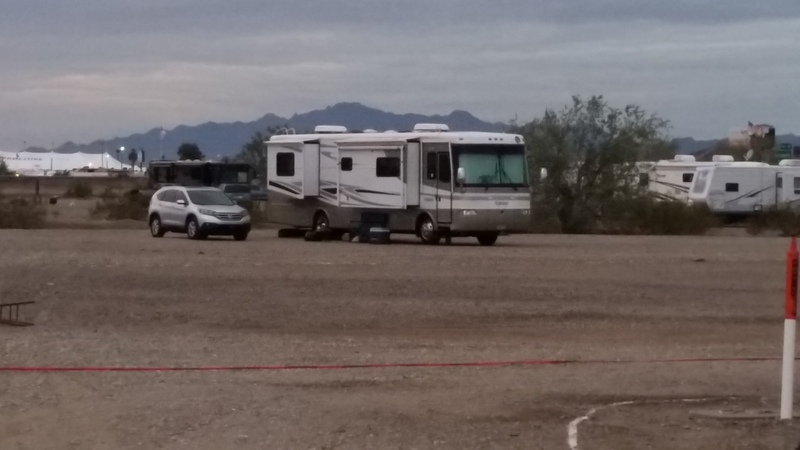 Not sure if we are dry camping or RV park, have to make our minds up soon, January coming up fast. Installed SAFE-T-PLUS 2 days ago. Drove it up and down freeway and I am very pleased. Very stable and no more wandering. I installed it myself. The U-Bolt nuts were a little tuff to get off but after that it was pretty easy. Heading to Dolores CO. in a couple of wks and looking forward to a relaxing drive. OK I will try to add some info. First, thanks for all the help. Back in OCT. we were looking at a 2001 American Tradition. They would not come down in price so we moved on. We finally found a 2005 HR Neptune. Good price and good condition. Yes recall on trailing arms has been done. We have one 200 mile trip so far and are loving it. Planning a trip this spring to Idaho. We sold our class C which we had for 19.5 years. WOW, lots of memories. Thanks again for all the help. Looking forward to learning all about DP. Need help on this one. Inside and outside in perfect shape. one owner. always garaged. Spartan mountain master chassis. 73000 miles. Tires DOT 2015. 8.3 ISC engine with banks power. new batteries. Wife likes the inside. $ 65000. Any info or advise would be great. Also has all maintance records. Thanks to all of you. We found some things wrong with unit so we moved on. We have owned 2 class "C". I am retired now and looking at class "A". I learned aloooooong time ago if wife is happy everyone is happy. Still looking and thanks again. Looking at buying 2008 Damon. Anyone have any pros or cons. Ford V-10. 30000 miles Tires are 2013.